I found this bee in the garden yesterday. She was several metres from the nearest hive, and she didn’t get there with those wings. She must have been carried out by another worker who was clearing out the dead and the dying. I brought her inside to examine more closely, but didn’t get round to it until this evening, when I placed her on a microscope slide and had a look through the lens. To my surprise, she began to move in the warmth of the microscope light. I had assumed she was dead. This is the manifestation of deformed wing virus, DWV. I see it from time to time in my colonies. You can see that this poor bee’s wings are completely shrivelled up. Her abdomen also looks stunted. I learnt a lot more about DWV recently from the virologist Professor David Evans, who is known among beekeepers for his blog theapiarist.org. He was here in Cambridge last weekend and gave the first talk at the CBKA One Day Seminar. 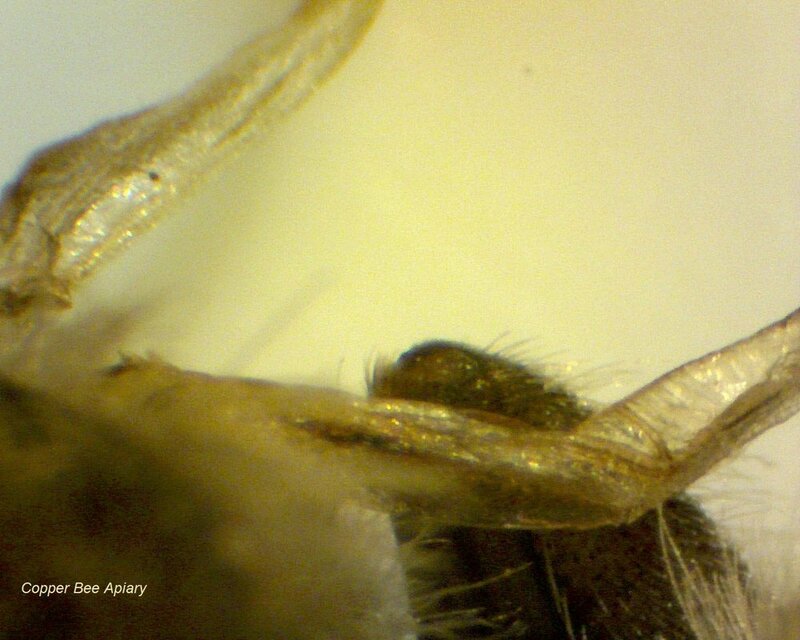 Prof Evans’s team have figured out that virtually all honey bees are infected with DWV, but the virus is asymptomatic when present at low levels in the bees’ bodies, and in this situation there are generally several different strains of DWV present. 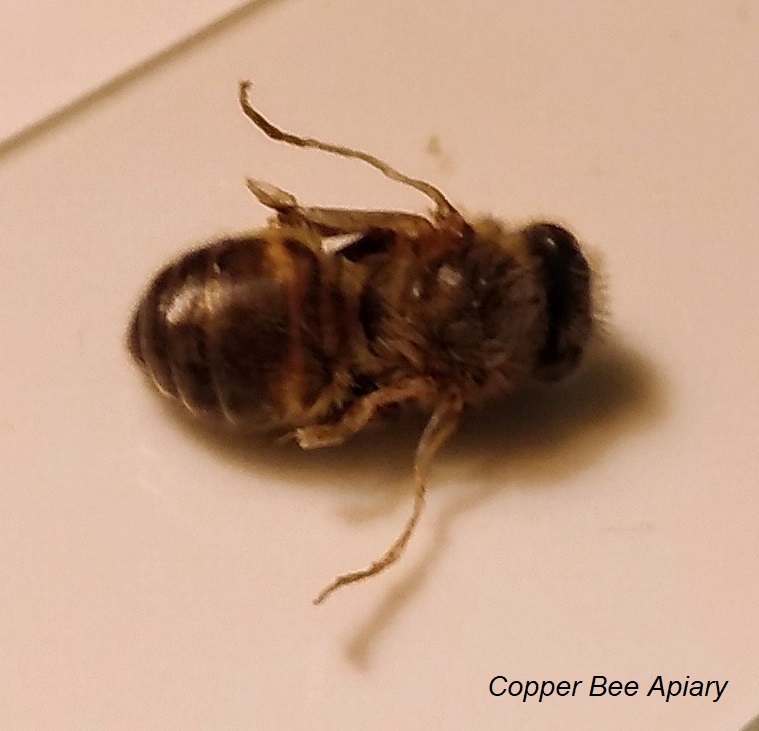 Where it goes wrong is when the varroa mite (a recently introduced parasite of European honey bees, first reported in the UK in 1992) injects the virus into the bee’s body when feeding on it. This, somehow, makes a single strain of the DWV grow out of control, reaching dangerously high levels in the bees and causing physical symptoms including the eponymous deformed wings. If varroa mites persist at high levels in a colony, the DWV population changes from its basic “low level, high diversity” state to a “high level, low diversity” state. With a high infection level of the single strain of DWV, the bees show impaired learning, impaired foraging and shorter lifespan. The affected bees are presumably unable to contribute to hive life and are ejected by their sisters. The disease may kill an overwintering colony if there are not enough long-lived healthy bees to keep it alive until spring. Based on the biology, Prof Evans was able to identify the optimal times to treat bees to knock down the varroa population. The good news is that if a varroa-plagued colony can get rid of its varroa (at least to a low mite level - complete eradication being virtually impossible in most cases), the DWV infection should return to its healthy low level, high diversity state. I’m going to have to seriously look into oxalic acid treatments for a winter varroa treatment. One astounding fact from the talk: genetic testing of honey bee colonies indicated that between 13 - 42 % of bees in a colony are “alien” to that colony, i.e., not born in that colony. Bees “drift” between hives…and the drift rate can be very high, it seems. The measure was 37 % for drones, which is unsurprising - drones are known to come and go between different hives. But such a high proportion of workers?! 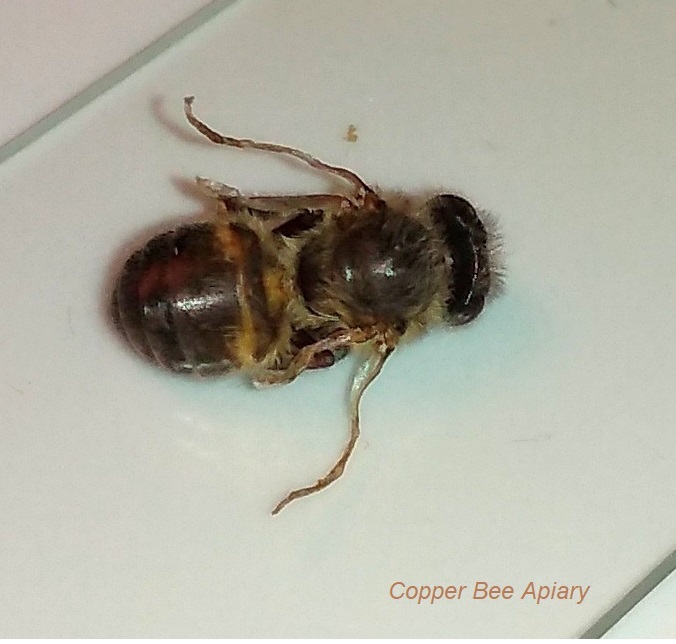 Apparently, a colony can acquire 5 to 75 varroa mites per day through such inter-hive migrations. I guess that is if the colony starts with low varroa but has a neighbouring hive with high varroa. I don’t know what such bee drift means for a set-up like mine where some hives in the apiary test positive for EFB and others test negative - have all the colonies been exposed to the infection - presumably yes? Perhaps a moderately high threshold level of the bacteria need to be present before they cause a problem. I should finish by saying that, despite all this talk of death and disease, it’s not all gloomy! When you walk through the apiary on a warm day now, you catch the smell of bee hives on the air again. Spring is in the air, and so are the bees! I am hoping to do my first hive inspection in the next few days.